Despite the advances in dentistry and the fact that it seems like there is a dentist on every corner, millions of Americans end up losing all of their teeth. For hundreds of years, the solution to this problem has been dentures. While traditional dentures lack any anchorage in the jawbone, they still provide a better chewing and speaking scenario than a complete lack of teeth does. Many denture wearers, and their loved ones, mistakenly assume that a lack of teeth means there is no longer any need for dental care. The truth is that just like a person with teeth, denture wearers need to take care of their mouth at home and see a dentist regularly. In order to take great care of your denture, there are several things that must be done on a regular basis. Neglecting these maintenance tasks can lead to serious problems, like dangerous infections and an increased risk for oral cancer. 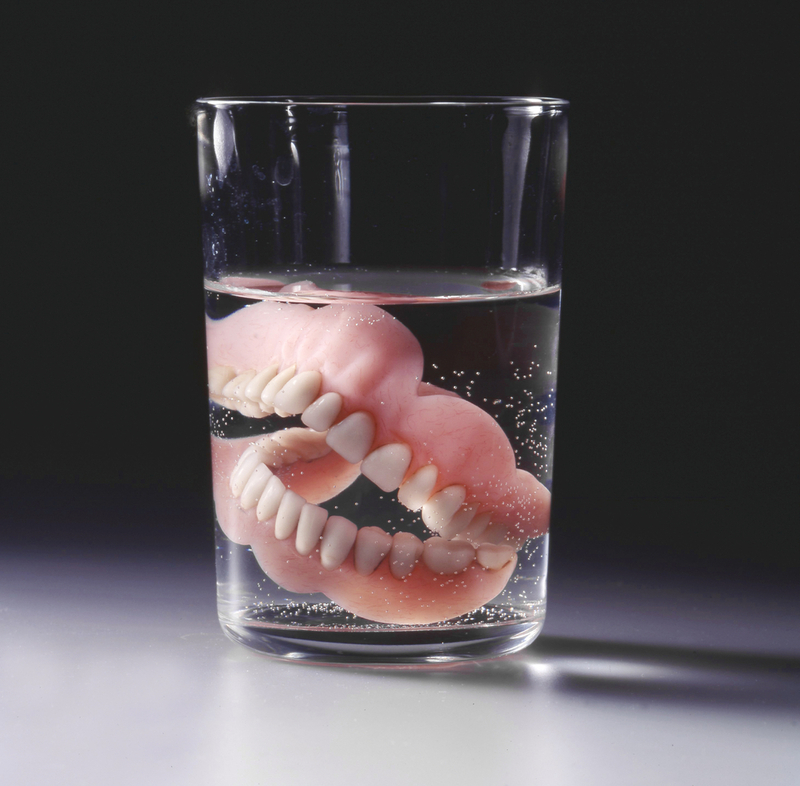 Dentures collect plaque, bacteria, and food debris just as natural teeth do. They also collect stains from dark colored foods and beverages. To keep your dentures looking and feeling clean, there are two important cleaning methods. First, always brush your denture. Use a soft denture brush to remove debris from the surface of the denture. You should not use any toothpaste. Toothpastes can be abrasive and leave small scratches on the denture. If the acrylic of the gums and the plastic of the teeth have a roughened surface, they are more likely to collect buildup and stains. Then, you should soak your denture in a denture cleanser with the Seal of Acceptance from the American Dental Association. An overnight denture cleanser like Efferdent kills bacteria and dissolves tougher stains. Your gum tissues need time to rest without the dentures in place. The best time to accomplish this is overnight. You should not sleep with your dentures in place. Keeping dentures in your mouth for too long leads to irritation and inflammation of the soft tissues inside your mouth. In some cases, painful fungal infections like thrush develop. Removing your dentures at night helps keep the tissues inside your mouth as healthy as possible. It is important to take your denture in to the dentist for a professional cleaning at least once or twice per year. We have antibacterial solutions and ultrasonic machines that can do a “denture deep cleaning”. This cleaning can remove dark stains and residue from adhesives that may be tough for you to clean away at home. Having your dentures “deep cleaned” is not the only reason to see your dentist regularly. You also need to have consistent dental visits for evaluation of the fit of your dentures and an oral cancer screening. Most denture wearers have a slightly elevated risk for oral cancer due to years of chronic infection and inflammation. An evaluation of the fit of your dentures allows your dentist to catch possible irritation spots before they start. A poorly fitting denture is more likely to cause sore spots, ulcers, and embarrassment. 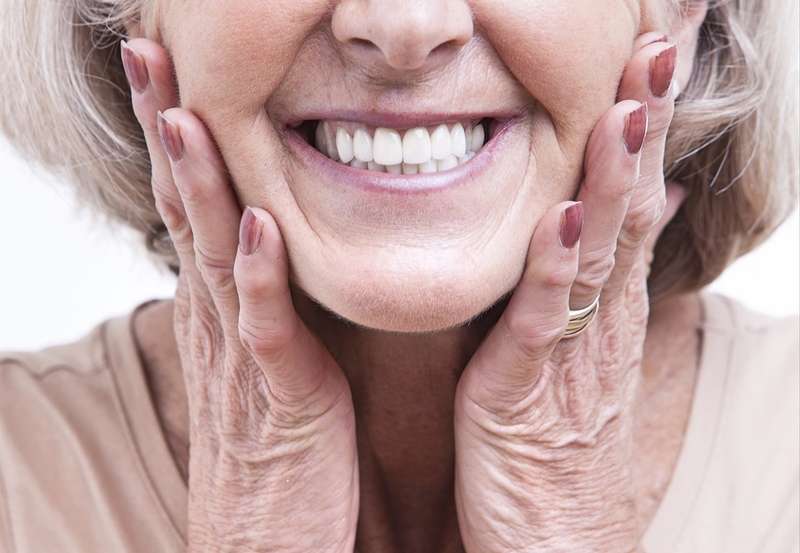 Even with great maintenance, dentures can develop problems. The most common problems we see in our denture wearers are: looseness, breaking, or a tooth falling off the denture base. This is, by far, the most common denture problem that we see. And there is a very good reason for it: Dentures do not change shape, while your jawbone and gums do. After your dentist removes the teeth, the jawbone and gums slowly undergo a shrinking process. Over time, they get narrower and shorter. As the bone and gums shrink, a space develops between the inside of the denture and the gums. The denture no longer fits closely against the gums, and there is no possibility of a suction effect. If the air space is small, adhesive may do the trick. There are several great solutions to the problem of a loose denture. Denture Reline – A reline adds new acrylic material to the inner surface of the denture to fill in the air gap and recreate the intimate fit of the denture with the gums. 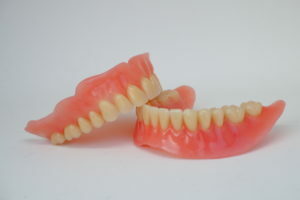 Denture relines are relatively inexpensive procedures and take approximately one day. They improve denture fit by increasing the surface area of contact between the denture base and gums, thus improving the likelihood of a suction effect. New Denture – For many patients, a fresh start with a brand new denture provides the best possible retention for a traditional denture. This is a great option for patients who have already tried relines without much improvement in their denture fit. 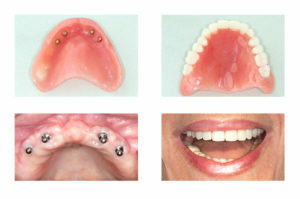 Implant Support – Many patients are unable to make traditional dentures work. They cannot obtain a suction effect, never feel comfortable chewing or talking in front of others, or simply cannot handle the amount of material in the mouth. If any of these scenarios describe you, you need to consider adding implant support. Implant-supported dentures are a whole new ballgame. By connecting the denture to an implant anchored into the jawbone, you no longer have to rely on suction or bulky materials for retention. The denture stays in place due to its attachment to a secure connection with the implant abutment. Dental implants provide the absolute best retention for dentures. Unfortunately, denture materials are relatively brittle, and they cannot withstand being dropped onto a hard surface. A quick slip of the hand while cleaning your denture in the sink could result in a broken denture. A denture is especially weak in areas where the acrylic base is thin. If you see through a certain area when you hold your denture up to the light, that is a weak spot. If your denture breaks, call your dentist immediately to schedule a repair. Some quick repairs can take place in the dental office, but a dental lab technician needs to perform a final repair. Even after repair, the area in which the denture broke will always be a weaker area in the denture, more likely to break again in the future. If your denture breaks, you should keep in the back of your mind the eventual need to replace it with a new denture. Rarely, a single tooth will break away from the denture. Like a broken denture, this may pose an area that will always be weaker than other areas of the denture. Call your dentist immediately, and DO NOT attempt to superglue it back into place. Superglue can interfere with the bonding of material that must occur to re-bond the tooth into place. We must bond the tooth back to the denture with materials that are compatible with the denture acrylic. More Questions about Taking Care of Dentures? Call Designer Smiles today to schedule a consultation with Dr. Ann and Dr. Lauren. They can answer any denture question you have, and they will perform a complimentary oral cancer screening with every denture evaluation.